For our next Future Craft assignment, we had to dissect a product (either physically or virtually) and then make a source map of the materials used to make it. The ideas is that, through the method of mapping, we'll gain an increased awareness of the footprint carried by things as they move from factory to household. 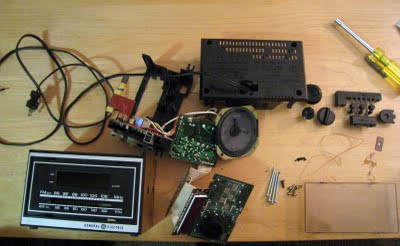 I chose to dissect an old clock radio that's been in my house forever, but just recently started to cough and sputter. See the map's details below. For more detailed information about the process, click the photo above. This project made me consider how things are actually made and where they come from...so in that sense, I suppose it was a successful one. Awareness is the first step in action, although with complex supply chains already in place, it's hard to see how one might reform them or make products that are truly "local" if you need something only manufactured or found in, say, Russia.